In this tutorial, we will see how to insert a document into the collection. We will understand this with the help of multiple examples. Lets take an example to understand this . Here we are inserting a document into the collection named “beginnersbook”. The field “course” in the example below is an array that holds the several key-value pairs. To insert multiple documents in collection, we define an array of documents and later we use the insert() method on the array variable as shown in the example below. Here we are inserting three documents in the collection named “students”. 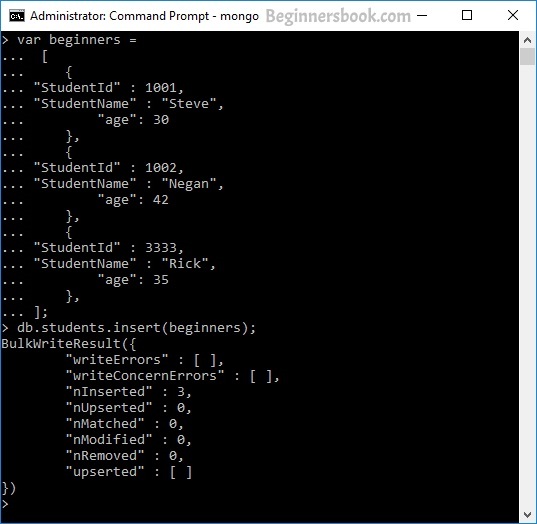 This command will insert the data in “students” collection, if the collection is not present then it will create the collection and insert these documents. As you can see that it shows number 3 in front of nInserted. this means that the 3 documents have been inserted by this command. In the screenshot below, you can see the difference. First we have printed the documents using normal find() method and then we printed the documents of same collection using JSON format. The documents in JSON format are neat and easy to read. 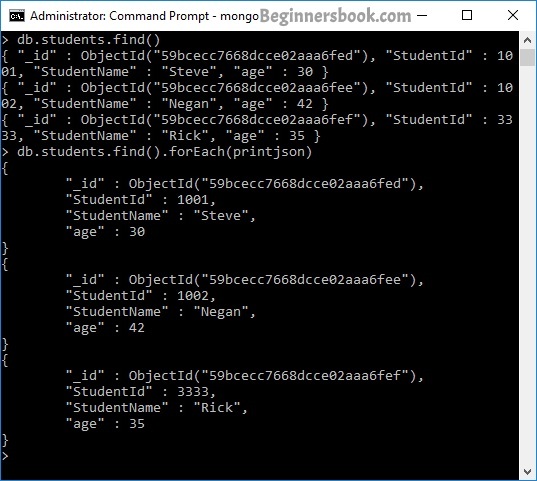 We can also insert multiple documents using the New Bulk API introduced in MongoDB 2.6. We will learn that in the Bulk API tutorial.